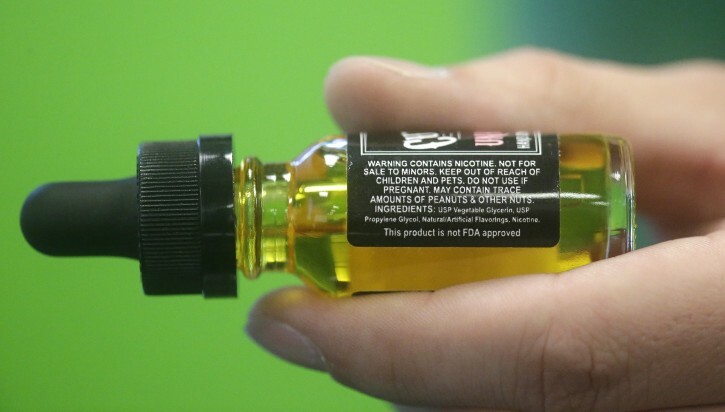 Chicago - Electronic cigarettes have sickened rising numbers of young children, a study of U.S. poison center calls has found. Most cases involve swallowing liquid nicotine. While most kids weren’t seriously harmed, one child died and several had severe complications including comas and seizures. “This is an epidemic by any definition,” said lead author Dr. Gary Smith, director of the Center for Injury Research and Policy at Nationwide Children’s Hospital in Columbus, Ohio. Monthly calls about young kids’ swallowing, inhaling or touching e-cigarettes climbed from 14 early on to 223 by the study’s end. Calls totaled 4,128 during the study. Most children were age 2 or younger. The cases represent 14 percent of the nearly 30,000 calls about kids’ exposure to nicotine and tobacco products during that time. “Many emergency physicians are going, ‘What the heck, this is really a problem, why aren’t they doing anything about it?’” she said. “If you use these products, you need to treat them as medication or toxins and keep them closed, locked and out of reach of children,” said Shook, who wasn’t involved in the study. Gregory Conley, president of the American Vaping Association, noted that more recent data from the American Association of Poison Control Centers indicate that exposures to liquid nicotine may be on the decline. However, the most recent numbers don’t indicate whether the decrease includes young children. He said most vaping liquid products use child-resistant packaging.